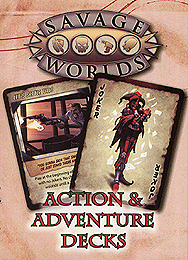 The Adventure Deck puts some story control in the hands of the players and lots of spice into the action. Add story twists like romantic interests, enemies, and larger-than-life opponents at the drop of a hat. See characters pull of amazing feats. Bring more excitement to your gaming table than ever before.